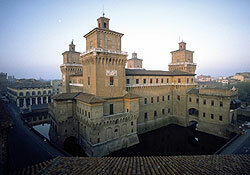 Mantua, surrounded by lakes, was one of the great centres of art and learning during the Renaissance. From 1328 until the 18th century Mantua was ruled by the Gonzagas who maintained the independence of their duchy (as it became in 1530) and the prestige of their court through cunning diplomacy, astute marriages and military accomplishments. Many of the Gonzaga princes were great patrons of art and attracted some of the most famous artists of the time to their court: Pisanello, Mantegna, Alberti, Giulio Romano, Rubens and Monteverdi all worked for them. Mantegna’s frescoes in the Camera degli Sposi (Bridal Chamber) in the Ducal Palace in Mantua were produced in 1465-74. These famous secular frescoes with their images of court life and the surrounding countryside of Mantua, mark a high point of courtly art. The depiction of landscape and the open sky in the ceiling of the room started a fashion for such decoration. At the same time as the Gonzaga commissioned great fresco cycles, Leon Battista Alberti was also providing Mantua with canonic architectural works. His two great Mantuan churches, San Sebastiano (1460) and Sant’Andrea (1472), established new models for church building in which the style of the antique dominated over all other considerations. Later Giulio Romano, who designed the buildings and frescoes of the Palazzo del Te, gave to the Gonzaga and Mantua a whole new repertoire for buildings designed for pleasure. Here the imagination, as well as the knowledge, of the artist is demonstrated in an inventive and sometimes capricious manner to create a stunning pleasure palace in which buildings and garden are united in one grand Mannerist reworking of the antique. Ferrara was the centre of the city-state ruled by the d’Este family. Their dynasty, which ruled from the 13th to the 16th century, established a court that became one of the most lavish and cultured in Renaissance Italy. The Castello Estense built in the 14th century was later transformed into a prince’s palace between the 15th and 16th centuries. Borso (1413-1471) and Ercole d’Este (1431-1505) stand out because of their contribution to the enlargement of Ferrara and the extension of the canal system around the city. 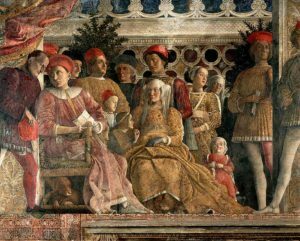 Between them they provided the basis for the new civic organisation of Ferrara and could be regarded as the first rulers to take urban planning seriously. The architect for their urban extensions, Biagio Rossetti, was also responsible for the design of Palazzo Schifanoia, which was built in the 15th century and contains a cycle of frescoes painted by Francesco del Cossa and Ercole de Roberti. Biagio Rossetti also designed the most significant piece of urban architecture in Ferrara, the Palazzo dei Diamanti (which now houses the Pinacoteca Nazionale) whose diamond shaped rustication gives this magnificent building its name. Centrally located Hotel Mantegna*** in Mantua and centrally located Hotel Touring*** in Ferrara. £588 inclusive of tuition, airport transfers (only available for the Siragusa Tours Ltd nominated flight), transfer from Mantua to Ferrara, bed and breakfast tariff in twin-share room with private facilities. Once the tour is viable and flights are booked please make sure you book your travel insurance. If we have booked flights on your behalf through Travelpack then you can call Lina on 0208 5854010 ext 1008, Mon – Fri 9 – 4 , for an immediate quote (up to the age of 84). Scheduled flight to Verona and return from Bologna (or Verona depending on what is more convenient). Once the tour is viable we will contact you with details of the ‘nominated flight’. You can decide whether you wish to make independent arrangements (people from the North may wish to use a Northern airport) or whether you wish to be booked on the group flight. Please note that when we contact you with fares they are usually only valid for the day and may be higher (or lower) the next day. On the booking form you have the option to authorise us to issue flights if we can’t get hold of you. Daphne Joynes, BA, is an experienced lecturer and art historian who has led many gallery study days, Studytours and group visits to Italy. 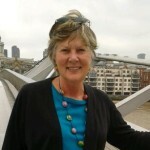 She has taught art history at a number of institutions including Surrey University and the Open University. She is a Guest Speaker for Noble Caledonia and lectures for organisations such as NADFAS and the National Trust. Her areas of interest are the Italian Renaissance and Italo-Byzantine art, as well as 18c Maritime History and 19c American art. Arrival and transfer to Hotel Mantegna in Mantua. Pm: Course introduction, orientation walk and visit to the Cathedral and Sant’Andrea. Pm: 14.30 Palazzo Schifanoia, Casa Romei.